(as has enrollment—up more than 33 percent since the mid- 1980s). The husband-and-wife team of Bren Karcich and Ian Slater can’t quite match Nancy’s total of 29 summers, but certainly hold their own with 21 and 22 years respectively as Scatico’s caretakers. They started working alongside Al and Peggy Adams (Ian’s stepdad and mom), making for 48 consecutive summers of a single family heading maintenance at camp. A quick walk around camp and you’ll see Bren and Ian’s work everywhere: all the wooden beds and nightstands in cabins; flower beds; the deck by the dining room; the octagon meeting area by the Admin... The list goes on and on. Yet you don’t make 95 summers as a camp without embracing the future. We are thrilled to welcome Kerri Berkman Winderman as our new girls head counselor. Kerri was a camper, counselor, and division leader in the 1980s-90s and has worked the past two summers as Nancy’s assistant head counselor. During the “off- season,” she’s a curriculum specialist for the Rye, NY, school district. The photo from 1989 to the left shows Kerri with former bunkmates who were then all working (under Nancy) as counselors. Edward Lydon (Teddy) started at Scatico as an 18-year- old maintenance assistant in 1997 and in October moved onto campgrounds (with his wife Jenn and son Mason) as camp’s new caretaker. If your keeping score at home, that’s only four generations of Scatico caretakers in 95 years: Fred Peterson, Al and Peggy, Bren and Ian, and Teddy. At Scatico, looking both back into the past and ahead into the future, we feel lucky and blessed by so much commitment and loyalty. Above: Scatico founder Nat Holman graced a Wheaties box more than 50 years before Michael Jordan (also of basketball fame) made his first appearance on one. Nat ap- peared on two “back box” panels in the late 1930s. 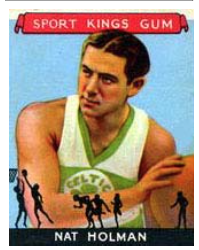 The cartoon was part of a late 1940s advertising campaign and describes Nat as being “generally acknowledged as the greatest player and coach in the history of basketball.” The first athlete to appear on a Wheaties box was Lou Gehrig in 1934. Rosenblatt were also Scatico campers. 1941. His children Jack and Susan were campers in the 1950s and 1960s. Judge Feinberg was appointed as a Federal Appeals Court Judge by John F. Kennedy in 1961, and served into the 2000s. (Current Scatico father and alumnus Andrew Tannenbaum clerked for Judge Feinberg in 2002-03.) Among many notable rulings, in the late 1970s Judge Feinberg helped determine that a North Carolina textile company was required to allow its workers to unionize (this case inspiring the 1979 movie “Norma Rae”—with Sally Field earning a “best Actress” award in the title role). Alex Holman, Judge Feinberg’s longtime camp friend, tells how through his entire career the Judge left standing orders in his office to put through any phone calls from people asking for “Billy” as they must be Scatico friends. Top—Dennis in 1950 outside Bunk 9 with his counselor Paul Sar- banes. Paul (nicknamed “Tyke”) was 17 years old at the time and still 27 years away from serving in the United States Senate. His 30-year tenure (1977-2007) as a Senator from Maryland, is the longest in the State’s history. Below—Bunk 12 in 1951. From left to right: Steve Manis, Billy Grossman, Dennis, Billy Manis, Mike Atkins, and Alan Harris. The counselors are Don Herzog and Ed Brenner. Zak Penn sent in this photo from his 1981 Bar Mitzvah. That’s Zak bottom left (“with the bounce in my hair”) and bunkmate Jon Reinsdorf bottom right (“too tight jeans”). In the middle (left to right) are Mike “Maz” Madorsky (a 1981 Upper Senior) and coun- selors Hillel Italie and David Fleischner (Zak’ s 1980 division lead- er). Zak, a screenwriter and film director, lives in Los Angeles. to sign “You Light Up My Life”—leading to a memorable group performance at a 4th of July Talent Show. Stay connected with fellow Scaticonians by e-mailing news, photos, and recollections to info@scatico.com. If you prefer the regular mail and printed pictures, that works just as well. We will even return the photographs after reproducing them for the Alumni Newsletter. please email news and photos for the Fall 2014 issue of the Alumni Newsletter to info@scatico.com. 􏰀􏰁 Ainslee Schreiber and Scott Kaufman (1995- 2006) were married on 8/31/14. Joining Scott’s brothers Rob and Josh in the celebration were David Sarraf, Harris Sarraf, Ryan Meltzer, Ben and Hope Mandel Amsterdam, Zach Miller, Lara Stahl, Mike and Rachel Hol- lander Heller, Charlie Bernard, Ian Meltzer, Mitch Polay, Melissa Plush, Simon Schwam, Adam Lasker, and Josh Wigler. 􏰀􏰁 Eitan Azizian and Lauren Sherrard (1996- Scatico friends join “Scotty K” at his wedding 2005) on 8/24/14. Lauren’s former bunkmates Jenni, Levine, Robyn Mohr, and Stephanie Bukantz attended along with Chas and Ellen Levine. (1990s-2000s) on 10/18/14. Joining Rachel’s parents (Bob and Joanne) and siblings (Paul and Lauren) were sister and brother Eiko and Yosuke Suzuki , Ste- ve Hanft, and Chas and Ellen Levine (who clearly had a busy fall wedding calendar). Bob’s Scatico ca- reer began in the 1960s as a camper and ran into the 1970s as a counselor. Then after taking the 1980s off, he returned for 10-plus summers as a camp doctor in the 1990s and 2000s. 􏰀􏰁 Kevin Khani and Dana Wattenberg (1990-97) on 10/12/14. In addition to her big brother Aaron, Caryn Ecker attended. Ally Lipton, who ran Scatico’s new cooking program this past summer (see next page) technically was also present, but in the role of full-service event planner and caterer. 􏰀􏰁 Chase Samuel on 10/26/14 to Sharon and Ryan Meltzer (1992-2006). 􏰀􏰁 Luke Levon on 8/15/14 to Laura and Adam Fleischner (1980s-2000s). 􏰀􏰁 Zoey Lake on 9/5/14 to Laura and Josh Koretsky (1990s-2000s). 􏰀􏰁 Ezra Hudson on 8/30/14 to Sacha and Samantha Safran Bodner (1988-2005). 􏰀􏰁 Charley Alexa on 8/12/14 to Jon and Alison Goodman Ecker (1987-1994). 􏰀􏰁 Laine on 9/11/14 to Sasha and Josh Friedman (1991-97). 􏰀􏰁 Olivia Main on 6/19/14 to Anna and Jon Koren (1990s-2000s). 􏰀􏰁 Jack James on 5/14/14 to Jim Hein and Carrie Tendler (1991-95). Left to right: Andy Rubinson, Tom Rubinson, Roger Goldman, David Fleischner, Julie Strauss Greeley, Richard Rubinson, Amy Rubinson, Francesca Rubinson, Cessy Goldman Rubinson, Jane Greeley, Noah Wagner, Diana Wallerstein, Kate Greeley, Carol Rubinson Strauss, and Shay. (Margie Strauss Featherstone missed the photo.) Grandma and Grandpa Richard and Cessy Goldman Rubinson met at Scatico in the 1940s. For 2015—Plans are underway for a new dock system for the boys waterfront. 2014—A new “Culinary Center” (photos to the right) constructed on the site of the former bake shop; a new Squash Court wall on boys side; and bathroom renovations for the 5 back campus cab- ins on girls side. 2013—Lights for the girls athletics fields; a new Squash Court wall on girls side; and two new Gaga courts. 2012—A new dock system for an enlarged girls waterfront; construction of a music studio on boys’ side; the expansion and renovation of bunk 1A-B; and bathroom renovations in the Club- house and in Coves B and C.
The Cooking Center Ally Lipton (1980s 90s) returned “home” to head the new Cooking Center during the summer of 2014. Ally, a NYC- based events planner and caterer, ran (we must say) an incredible program, with campers of all ages. Jane Herzog writes: “W e organized a long overdue bunk reunion in Manhattan last August when I was on the East Coast (to drop off my son at Pratt Institute as a freshman. Nancy Lippman Halis hosted and people traveled into the city by car, train, and airplane to be there. It was so exciting to see each person arrive, and amazing how everyone looks so much the same, sounds so much the same, and has done so many good things with their lives. For some of us it’ s been over 30 years since we were in touch, but the Scatico bond is so strong, it seemed just like yesterday. We had the best night ever!” From left to tight: Laurie (Lou) Gruberg, Barbara Schulman, Ellen Greystone Kalikow, Jane Herzog, Nancy Lippman Halis, Robin Herfort Healy, Lee Gelb, and Jennifer Fleischner. Color War 2014: The more things change, the more they stay the same! Whether you were at camp in the 1940s, 50s, 60, 70s, 80s,... (you get the idea) these Color War images from last summer will look very familiar: Girls’ Sing and the Boys’ Potato Races on closing night. Vintage Scatico: 1930s? The driving range before dividers between the tee boxes and with the trees along the road newly planted. An alumnus has shared that there was so little tree cover (at camp and in the surrounding area) that you could stand by the pagoda, look out across the lake, and see Hunter Mountain (on the other side of the Hudson River) 35 miles in the distance.